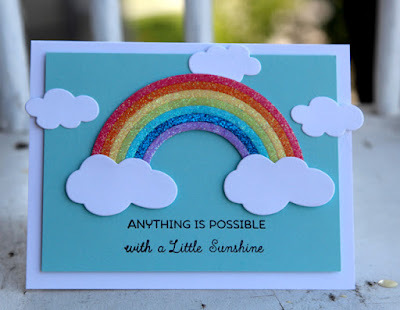 I decided to make a few more cards for the Superstar Challenge over at the MFT blog. For the first one, I featured a sparkly rainbow. I've been wanting to make a glitter rainbow for some time now. This die really makes it easy to do this. I applied some scor-tape to one side of some white cardstock, then ran it through the cuttlebug. When I took it out of the die, each arch was cut, but the whole item was still somewhat fused together. I applied tape to the back to ensure that it would stay together. Then I simply removed each arch at a time and added my glitter one colour at a time! Love the effect! I completed the card by making a sky scene on some Cool Caribbean cardstock and adding in a few clouds. The sentiment comes from Tickled Pink. I separated the greeting so I could have it say exactly what I wanted instead of the original "Anything is possible with sunshine and a little pink". My next card is a bit of a step outside the usual for me. It actually started the other night. I made a background by starting with the pretty little flower from the Penguins in Paradise set. I stamped it with Versamark onto some glossy white paper. Next I sponged some tropical colours over (colours here are PTI's Tropical Teal, Hawaiian Shores, Limeade Ice, Harvest Gold, and Orange Zest). I was really struggling with what to put with the background. I kept looking to the other images in the Penguins in Paradise stamp set, but when I coloured and cut them out they just didn't have that POP that I wanted. So finally today I thought, why not flamingos! I die cut a pair out and decided to show them in love. 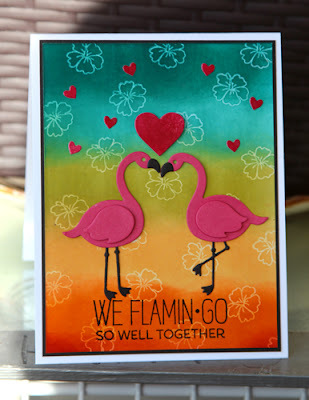 I thought this sentiment from Tickled Pink was a cute punny one to go with the scene. The hearts were also cut from some glossy paper. I sponged some Raspberry Fizz onto glossy white and then die cut them out and placed them into the scene.